Scientists at the University of Southampton are to investigate the best way to use natural killer cells (NK) to target the most common form of liver cancer. NK cells are able to directly kill cancer in the body and stimulate other cells in the immune system to help attack cancer. At the moment, NK cells, and the chemicals that manipulate them, are being used to treat a variety of different cancers, mainly cancers of the blood. However there is growing evidence that these cells could be used to create an immune response to hepatocellular cancer (HCC) cells and be used to kill them. HCC is the most common form of liver cancer and is mainly caused by cirrhosis of the liver – where the liver has become scarred as a result of damage over a long period of time. Funded by the British Liver Trust, researchers at the University of Southampton will investigate how to manipulate NK cells to attack HCC cells. The University’s Salim Khakoo, Professor of Hepatology and Aymen Al-Shamkhani,Professor in Immunology will be leading the study. Professor Khakoo explains: “Hepatocellular cancer accounts for 90 per cent of all primary liver cancers and is an extremely difficult condition to treat. At this early stage of the study we aim to create a method to form the basis for a clinical trial to use NK cells to treat HCC. 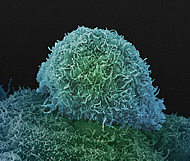 When the team has developed a successful method for stimulating the NK cells, tests will be carried out to determine the best way to use them for an anti-cancer effect.